A brigade's commander is commonly a major general, brigadier general, brigadier or colonel. In some armies, the commander is rated as a General Officer. The brigade commander has a self-contained headquarters and staff. The principal staff officer, usually a lieutenant colonel or colonel, may be designated chief of staff, although until the late 20th century British and similar armies called the position 'brigade-major'. Some brigades may also have a deputy commander. The headquarters has a nucleus of staff officers and support (clerks, assistants and drivers) that can vary in size depending on the type of brigade. On operations, additional specialist elements may be attached. The headquarters will usually have its own communications unit. The brigade was invented as a tactical unit by the Swedish king Gustavus Adolphus. It was introduced during the Thirty Years' War to overcome the lack of coordination between normal army structure consisting of regiments by appointing a senior officer. The term derives from Italian brigata, as used for example in the introduction to The Decameron, where it refers only to a group of ten, or Old French brigare, meaning "company" of an undefined size, which in turn derives from a Celtic root briga, which means "strife." The so-called "brigada" was a well-mixed unit, comprising infantry, cavalry and normally also artillery, designated for a special task. The size of such "brigada" was a reinforced "company" of up to two regiments. The "brigada" was the ancient form of the modern "task force". This was copied in France by Maréchal Turenne, who made it a permanent standing unit, requiring the creation in 1667 of a permanent rank of brigadier des armées du roi (literally translating to "brigadier of the armies of the king"). Unlike the Swedish brigades, French brigades at that time were composed of two to five regiments of the same branch (brigade de cavalerie, brigade d'infanterie etc.). Brigadiers at that time could be chosen not only from the ranks of colonels in charge of regiments but also among lieutenant-colonels, officers which, typically, could not afford the cost of a regiment but had proved their value in combat. The rank, intermediate between colonel and maréchal de camp, disappeared in 1788 and should not be confused with that of général de brigade, which is equivalent to a brigadier general. (A modern général de brigade is sometimes referred to occasionally as brigadier for short, which can be confusing). In the Australian Army, the brigade has always been the smallest tactical formation, since regiments are either administrative groupings of battalions (in the infantry) or battalion-sized units (in the cavalry). A typical brigade may consist of approximately 5,500 personnel between two mechanised infantry battalions, an armored regiment, an armored artillery regiment, and other logistic and engineering units. The brigade is usually commanded by an officer holding the rank of brigadier, who is referred to as the "Brigade Commander". There are seven independent armoured brigades, seven engineering brigades and eight air defense brigades. Independent armoured and infantry brigades are capable of extended operations without necessarily being reliant on a higher HQ for short-term logistic or intimate support. They can be used in counter-attack, exploitation of an advance, or rapid movement to reinforce formations under pressure. Three independent brigades are at Malir, Pano and Aqil, Hyderabad and are operating under V Corps, Karachi. France replaced its divisions by brigades in 1999 (so for example the 2nd Armored Division became the 2nd Armored Brigade). It was decided in 2016 to again form two divisions (first and third) made up of four and three brigades for a total of seven brigades: two armored, two "intermediate", two light brigades (alpine and parachute) and the Franco-German Brigade. There is also an airmobile brigade subordinated to the army aviation command. Brigades, with a field not a regional administrative role, have usually been of a named type and numbered since the 19th century (e.g. cavalry brigade or infantry brigade). From after World War II, brigade numbers have been unique and not by type. Brigades in divisions do not usually command their combat support and combat service support units. These remain under divisional command, although they may be permanently affiliated with a particular brigade (as a "brigade group"). Historically, infantry or cavalry/armored brigades have usually comprised three or four combat-arm battalions, but currently larger brigades are normal, made larger still when their affiliated artillery and engineer regiments are added. In the Second World War, a tank brigade comprised three tank regiments and was equipped with infantry tanks for supporting the infantry divisions. Armored brigades were equipped with cruiser tanks or (US Lend-Lease) medium tanks and a motorised infantry battalion. The armored divisions included one or more armored brigades. An NRA Brigade, 旅, was a military formation of the Chinese Republic's National Revolutionary Army. Infantry and cavalry brigades were composed of two infantry regiments. 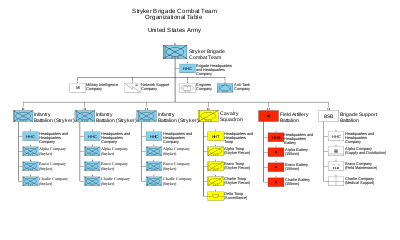 After the 1938 reforms, the brigade was dispensed with within the infantry division in favor of the regiment to simplify the command structure. The brigade commander is usually a colonel, although a lieutenant colonel can be selected for brigade command in lieu of an available colonel. A typical tour of duty for this assignment is 24 to 36 months. In the United States Marine Corps, brigades are designated as Marine Expeditionary Brigades (MEB), and are usually commanded by a brigadier general. The MEB is a mid-level Marine Air-Ground Task Force (MAGTF) essentially forming a "demi-division." The MEB organizational structure is completely different from an army brigade, and consists of a minimum of three regimental-equivalent sized units and a command element (a Regimental Combat Team, a Composite Marine Aircraft Group, a Marine Logistics Regiment, and a MEB Headquarters Group). Each Marine Expeditionary Force (MEF) contains a MEB, available for deployment on expeditionary duty. The MEB is the intermediate MAGTF between the MEF and the Marine Expeditionary Unit (MEU). Along with the Marine Infantry Regiments, the MEU, (while smaller than an army brigade), are the USMC organizational equivalents of army brigades. The MEU consists of three battalion-equivalent sized units and a command element (a Battalion Landing Team, a Marine Medium Tilt-rotor Squadron (Reinforced), a Combat Logistics Battalion, and a MEU Headquarters Group). The Marine Infantry Regiments, combined with the Marine Artillery Regiments, comprise the bulk of the Marine Divisions. An example of a MEB is Task Force Tarawa (2nd Marine Expeditionary Brigade) during the Operation Iraqi Freedom campaign. ↑ Brazil, Portugal, Japan, and Taiwan. ↑ Maj-Gen Sir John Headlam, The History of the Royal Artillery, Vol II (1899–1914), Woolwich: Royal Artillery Institution, 1937. ↑ Hsu Long-hsuen and Chang Ming-kai, History of The Sino-Japanese War (1937–1945) 2nd Ed. ,1971. Translated by Wen Ha-hsiung , Chung Wu Publishing; 33, 140th Lane, Tung-hwa Street, Taipei, Taiwan Republic of China.